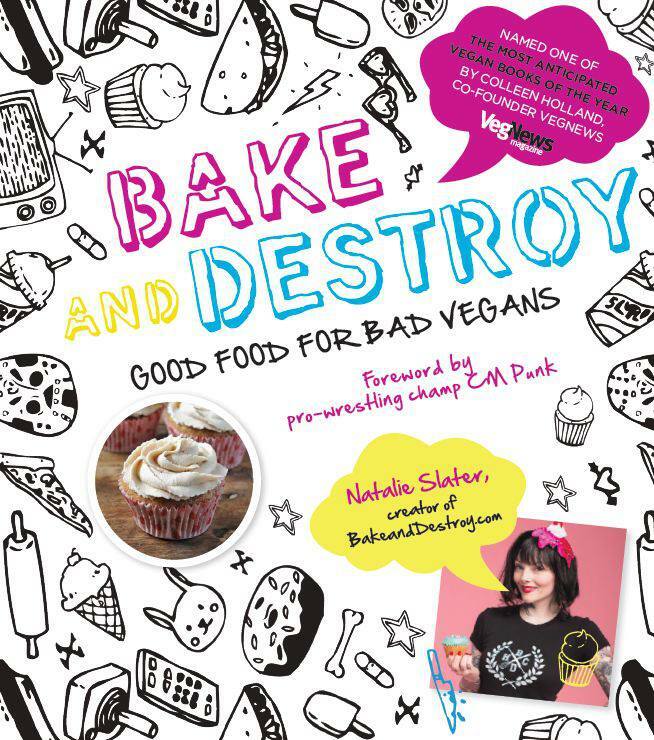 Today we welcome Natalie Slater, author of “Bake and Destroy: Good Food for Bad Vegans.” She shares with us one of her awesome recipes for an especially tasty Halloween cheesecake! 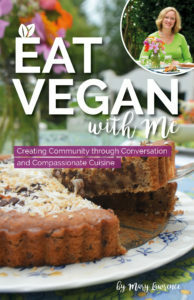 I’m very proud of my book, Bake and Destroy: Good Food for Bad Vegans for many reasons – the intro by pro-wrestler CM Punk, Celine Steen’s gorgeous photography, Betty Turbo’s hilarious illustrations – but I think what I am most proud of us the number of not just non-vegans, but non-vegetarians who have told me that this book is their new go-to for dinner ideas. What’s my secret to luring our omnivorous friends over to the “dark side”? Well, if you ask me, I believe the secret is nachos (and pizza, and tacos, and cheesecake). Vegan food doesn’t have to be complicated, scary or weird – and that’s really what my book is all about. Vegan food for everyone – even meat-eaters. Think being vegan means getting a trick-or-treat bag full of raisins? Think again! There are tons of tasty vegan options out there, my favorite being the Chick-O-Stick. Chick-O-Sticks are an old-school crunchy candy made with peanut butter and coconut. 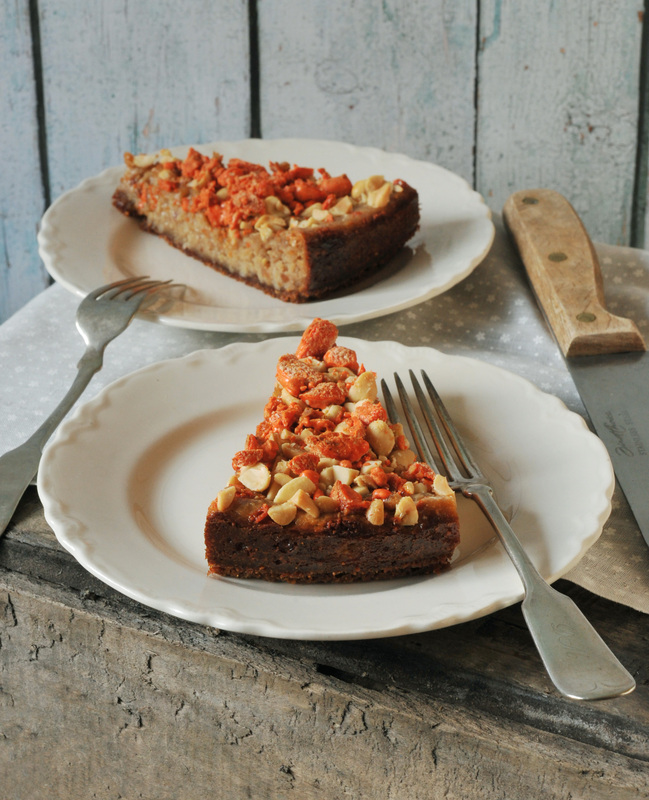 In this recipe from my book Bake and Destroy: Good Food for Bad Vegans, I smashed them up to make a crust for this creamy peanut butter-coconut cheesecake that comes together with a whirl of the food processor. Preheat oven to 350° and spray a 9 ½” springform pan with cooking spray. In a mixing bowl, combine graham cracker crumbs, crushed Chick-O-Stick and salt. Drizzle in 2 tablespoons oil, mixing well to moisten the crumbs. Add more oil gradually if needed. Add the soy milk, then press the dough into the bottom of the pan. Bake 8-10 minutes until firm, and set aside to cool. Leave the oven on. Drain the cashews and place in a food processor along with the tofu, sugar, brown sugar, coconut oil, cornstarch, lemon juice, vanilla extract, coconut extract and salt. Blend until smooth – there should be no chunks of cashew. Add the peanut butter and coconut and pulse to combine – this time there will be lumps of peanuts, and that’s OK.
Pour filling into prepared crust, top with chopped peanuts (add a sprinkling of crushed Chick-O-Stick, if desired) and bake on top rack for 45-50 minutes, until the sides are golden and the top is puffy. To prevent a cracked surface, place a baking sheet on the lower rack, topped with an ovenproof dish containing 2 cups of hot water. Remove the cheesecake from the oven and cool it on a rack for 30 minutes, then refrigerate for at least 3 hours before slicing. 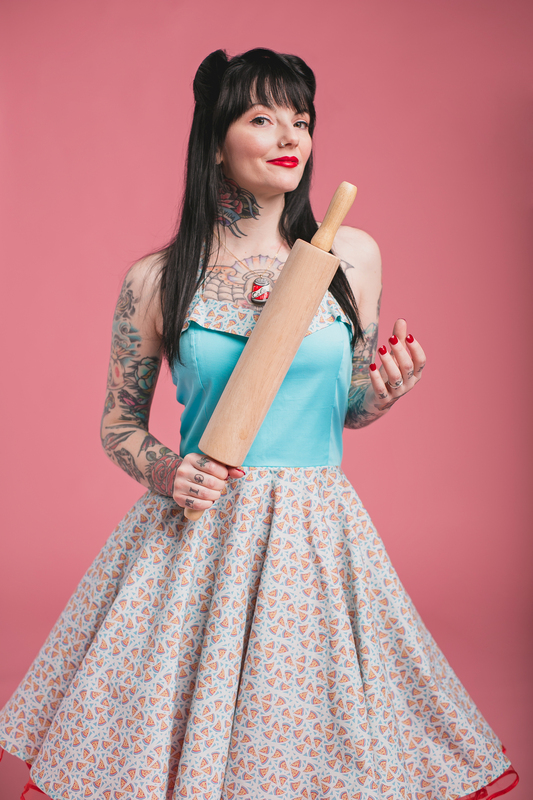 Launched in 2006, Bake and Destroy is the brainchild of Chicagoan Natalie Slater. Heavily influenced by her love of pro-wrestling, punk rock and heavy metal, the site features original recipes, interviews with chefs, indie designers and other interesting folks, and also serves as the home for mini-blogs SugarSlam and Food Puncher. Natalie has appeared on Food Network, The Cooking Channel, and WTTW Chicago Tonight as well as on the pages of Time Out Chicago and Bust Magazine.